Paul Busse creates elaborate, three-dimensional structures made of natural materials including mosses, twigs, leaves, and seed. Amazingly accurate in detail, his creations look remarkably like they were constructed of the originally used materials. 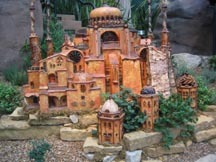 An exhibition of his work, Enchanted Express, is currently on display at the Franklin Park Conservatory. Architectural wonders of the world and places that exist in our imaginations can be found throughout the plant collections. A masterpiece of Byzantine architecture, the Hagia Sophia, is located in the Desert Biome. It was originally a Christian church constructed from 532-7 at the order of Justinian I. After the conquest of the Ottoman Empire in 1453, it became a mosque. In 1935, it was made into a museum. A different form of architecture, small-scale edible gingerbread houses created by youth, families, adults, and professionals, were also on display. Poinsettias, almost one hundred varieties, are strategically placed in the Conservatory to celebrate the season.